About a month ago, I had a pleasure of having a Guinot Signature facial. Now I don’t do in-salon facials often as I usually can’t spare the time during the day so prefer the at-home varieties in the evenings (which helps the hip pocket too) but whenever I can, I do like salon facial for a deep cleanse to clear congested skin, get my glow back and try to undo some of the toils that daily stress takes on. I was lucky to have the Guinot Facial experience in the heart of Melbourne CBD at The Australian College of Hair Design & Beauty, which meant that all I needed was a 1.5 hour lunch time break to fit it in. On the day, I chose to have the Hydra Lift facial as it is designed to stimulate facial muscles and firm skin and let’s be honest, who doesn't want bouncy firm skin? The Hydra Lift helps to achieve a sculpt and lift in the face with the aid of electrodes used during the facial that run micro-currents across skin to drain the lymphatic system and cause the muscles to contract thereby helping to tone and firm the skin. 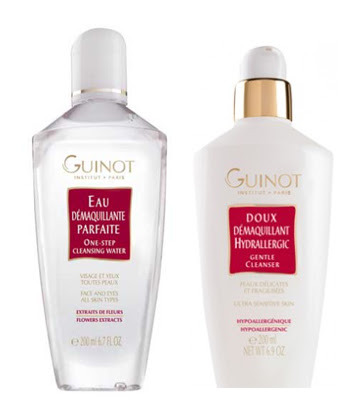 Before any treatment was performed, my facialist Laura - Guniot’s in-house beauty expert proceeded to remove my makeup with the one step cleansing water and then with a cleanser to remove any remaining impurities. The treatment then began with a conducting anti-aging serum gel applied to my neck and face before the electrodes were placed against my skin across my face, under the eye area and along my neck to help drain my lymphatic system. I definitely felt the effects of the lymphatic drain which helped to clear up my sinuses, a remnant of the flu I had at the time and afterwards, I was able to breathe clearly for a few hours again - it was a godsend I tell you! The next step of the treatment was the stimulation of the muscles. Again the electrodes were rolled down my face, but this time set with different power settings to cause muscles contraction. The muscle twitching feeling was very strange initially as I’m not used to my muscles moving outside my control but I quickly got used to it and it was never uncomfortable or painful. After this, the serum gel was removed from my face and neck and my skin was cleansed again before skincare was targeted applied to my eyes and face. Laura then proceeded to give me a relaxing facial, neck and shoulder massage. She gave me one of the best facial massages I've ever received and I almost drifted into sleep as it was so relaxing and comfortable (which usually never happens). In fact I was so relaxed and comfortable, I forgot to ask Laura to take a photo of me during the treatment to include in this post so I’m unfortunately having to rely on stock photos instead. Immediately Afterwards, I had glowing skin that looked plumped, smoother and firmer. My radiant glow actually stayed with me for 4 days and my skin felt sculpt and firm for a whole. I was told if you take a series of three-four Hydra Lift treatments, the results are even more lasting in between each treatment. The skincare products used during the treatment will be tailored specific skin concerns so each individual will get specialised skincare. For my treatment the following products were used. Facials are a pampering experience that I’d love to include on a regular basis into my skincare regimes as I move through my thirties when time and budget permits. 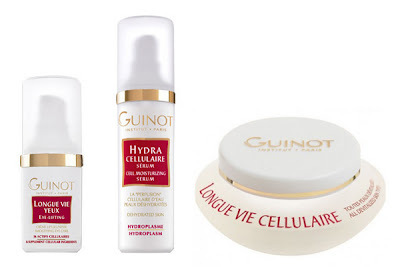 If you are interested in getting a Guinot Hydra lift facial, they cost about $125 from Guinot Salons for 1 hour treatment or if you're short on time, a 30 minute treatment will cost about $80. Thank you to Guinot and the College for such a pampering time out on a busy work week. And if you happen to be in Melbourne, you can receive a Guinot facial at greatly discounted prices at the The Australian College of Hair Design & Beauty which will be performed by graduating students and I suggest you book ahead for it. Check out their current pricing here but the current discounted rate is $85 for an hour facial. Eyelash Extensions - Are They Worth it? Win Your own Secret Sculpt Dress!